Competition drives anglers to fish at the top of their game. Human beings are competitive by nature and when anglers compete, great ideas are born. Tournament anglers learn how to manage inefficiencies. They find fish that other anglers overlook. They learn how to catch discerning fish, and not just accept that they are not biting. 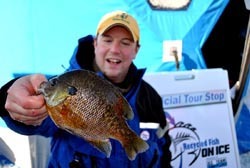 In a winter panfish tournament, success is measured by ounces rather than pounds. Missing a single bluegill could be the difference between cashing a check or leaving empty handed. Even if you dont want to approach your next ice outing like its tournament day, the techniques that are developed in the heat of battle can help all of us have more fun on the ice this winter. Here are some tournament winning strategies that will make you more successful on the hard water this winter. 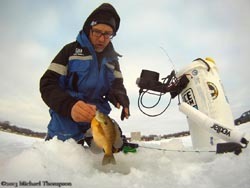 Schooley Reels- Michael Thompson, from the USA Ice Fishing Team, has been using Schooley Reels since the 1980s. He likes the fact that these reels do not twist line. The twists that are caused from line being spun around a fixed spool can be a panfish deterrent. Picky panfish want a jig that will rock and kick seductively but not spin. Schooley Reels have a plastic spool that revolves on a pin and wraps line on straight without twisting it. They are also extremely light weight and comfortable to jig with. The cost effectiveness of the Schooley allows an angler to rig multiple rods and switch presentations quickly. Mormyshka Jigs- These jigs have been a guarded secret among tournament pros for a long time. Instead of having an eye where line is tied on, these jigs have a hole that runs through the center. The line is then snelled around the hook at the base of the jig. This imparts an action that is irresistible to bluegills. These jigs also stay horizontal and eliminate the need to reposition your knot after every fish. Tricked out Buckets- Michael Thompsons fishing bucket is not something you will find in a sporting goods store. It is rigged up with a Ram mounted Vexilar. The flasher is mounted in an ergonomic position that allows him to see how fish are reacting to his presentation and watch his line for bites in the same field of vision. Looking back and forth between line and electronics could cost an angler that tournament winning bite. A clip on the bottom of the bucket holds excess transducer cable in place for ease of moving between holes. This is taking efficiency to an entirely new level. He can walk up, set his bucket next to the hole and begin fishing right away with no set-up required. According to Thompson, you are not catching fish when your jig is not in the water so a tournament angler must learn to limit down time. Michigan Rigs- This season, I have become obsessed with Michigan rigs. 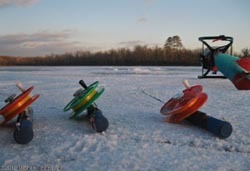 Its really nothing more than a drop shot rig for ice fishing. I start out by attaching a piece of leader material to my line with a blood knot. This leaves me with two tag ends. I pick the straighter of the two ends and attach a fly. The other end is then trimmed off and discarded. On the bottom of the leader I attach a split shot. Where its legal to use two hooks, a small horizontal jig like the Genz Bug can also be very effective. Ive been using a #14 soft hackle from Jeffs Jigs and Flies. com with great success. The slightest shake of the rod handle will bring these flies to life and allow them to swim perfectly in a horizontal manner. Shallow Cover- I have had some of my best days bluegill fishing in less than 7 feet of water. Predator fish, along with heavy fishing pressure, will often push the biggest bluegills into heavy cover. The key is to find small open areas near green healthy weeds. An underwater camera allows an angler to search out these openings and judge the quality of the weeds. I have also noticed that bluegills will often use specific highways to navigate through cover. Ive had days where we hooked fish all day in a highway through heavy cover while anglers 10 feet away never seen a fish. Finding these pathways is not magic. It comes down to lots of drilling and camera work. Speed Fishing- Tournament anglers fish fast. Fishing with a partner allows one angler to drill and the other to scope things out with the flasher. If no fish are present, the transducer is swung in the hole like a pendulum in all directions. If any suspended lines are seen this will give you an idea which direction to drill. The goal is to cover as much water as possible and connect with aggressive fish. Tungsten jigs fish fast and allow anglers to punch through slush without wasting time slush scooping holes. Consider fishing a tournament this winter. Competing with other anglers will get you thinking like an innovator and will improve your panfish game. Just make sure to share some of those great concepts with me. 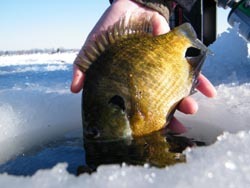 For more information on winter panfish visit our website at http://www.slabseekerfishing.com.